Yang Kwei Fei was an 8th century consort of the last Tang Dynasty emperor Xuanzong. Known both for her beauty and her fondness for alcohol, she is one half of one of the most famous love stories of ancient China. 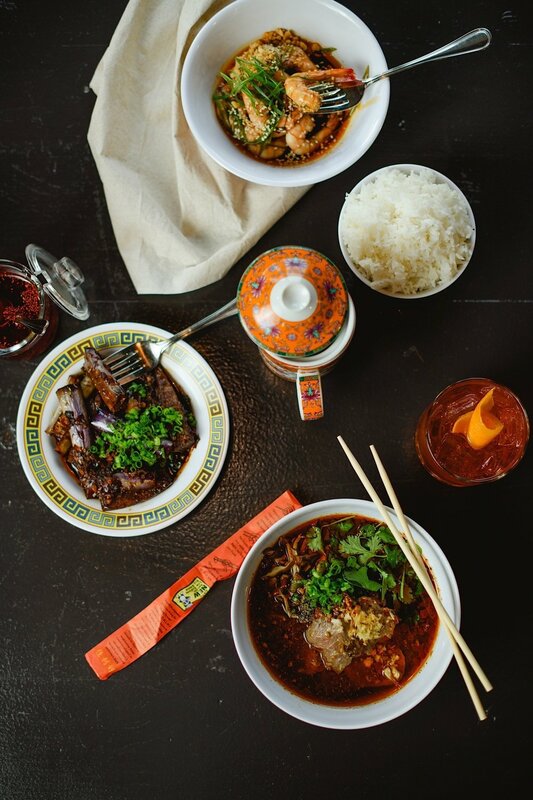 It is that love that has inspired Kwei Fei, a restaurant concept from chef David Schuttenberg featuring the foods of Western China, and more specifically the province of Sichuan. This style of Chinese cooking is known for its vibrant, colorful, and piquant flavors. Upon graduation from New Yorks venerable French Culinary Institute (Now ICC) in early 2004, David Schuttenberg spent time in some of the city’s highest regarded kitchens. He started his career under Tom Coliccio at NY Times 3 Star Craft, where he learned the value of cooking simply using the highest qualty ingredients, with impeccable technique. He spent 6 years under James Beard award winner Zakary Pelaccio, helping develop the venerable Fatty Crab brand,a street food-centric Malaysian concept in Manhattan’s West Village. He was named partner with Zak at NY Times 1 star Cabrito, where he cooked his beloved food of the Southwestern U.S. and Mexico. Before deciding it was time to leave the city in 2015, he spent 4 years with Jacob Dickson in arguably the best butcher shop in the country, Dickson’s Farmstand Meats as its chef and culinary creative director. To begin the process of moving toward his ultimate goal of opening and operating his own concept, David’s move to Charleston reunited him with his first chef from Craft, Damon Wise. He was named Director of Culinary Operations for the Scarecrow and Co. project on Ann St. where he worked side by side with the partnership team building out, and opening. From there he accepted the position of Executive Chef at Fish restaurant, overseeing the gradual shut down. Having enveloped himself in the Charleston dining scene, and gained an understanding of the market for the past 2 years, it is now time to realize his dream of opening a space where he can combine his cooking acumen with his personality. The AZ native followed her passion for design and fashion to art school in Denver and soon after made a cross-country trek to live in NYC and work in high fashion, holding A position at Zac Posen. During the economic recession of 2008, Tina left fashion to stay at home with her daughter full-time. Seeking to reinvent herself within her creative abilities, she pivoted to food and beverage by helping friends open trend-setting Brooklyn-based micro-grocery The General Greene. She then transitioned to the venerable Plaza Hotel to oversee the launch of it’s retail flagship The Plaza Food Hall, finally landing at the renowned Dean & Deluca where she oversaw merchandisINg. Before accepting a new role as Dean & Deluca’s Creative Director in 2015, Tina moved to Charleston, SC where she soon joined cAVIAR & BANANAS growing business as Director of Merchandising.